Game Of Thrones has been weighed, measured, and found pretty comparable to Lord Of The Rings, at least according to GoT author George R.R. Martin. 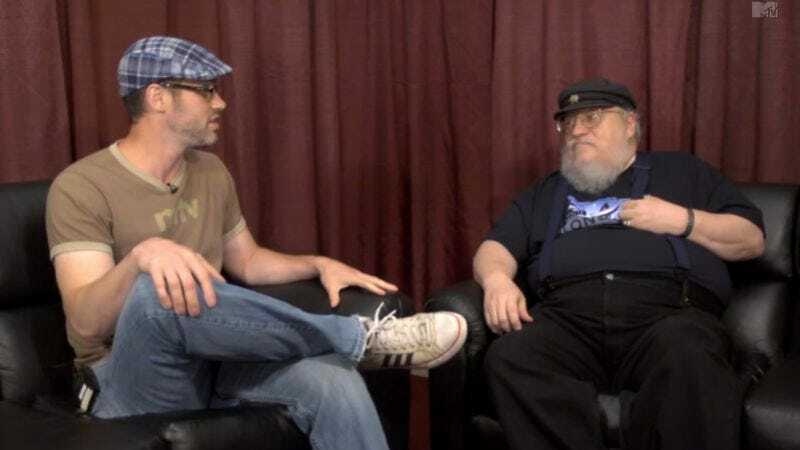 After “the Internets exploded” last year in the first GRR (Martin) vs JRR (Tolkien) battle, MTV Geek again asked Martin to explain why his characters are way better than characters created by a long-dead author who can’t speak for himself. Ever the diplomatic fanboy, Martin takes the character battles rather seriously, arguing that while an Uruk-hai might beat an Unsullied in one-on-one combat, the Unsullied are undoubtedly the better-trained army en masse. The final tally comes to LoTR: 3, GoT: 3, with three battles left to be debated through the ages until the Wall collapses and Helms Deep crumbles.